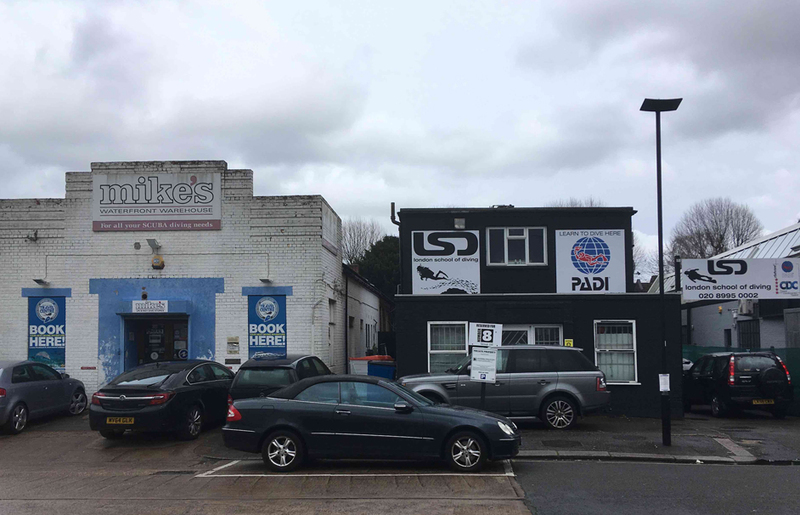 Then and now | Rollo Whately Ltd. It was with great sadness that I heard this week of the death of Gabrielle Rendell who ran Bourlet Frames in Connaught Street, off the Edgeware Road. I didn’t know Gay all that well but we were friendly over 20 years or more. She was a very positive, optimistic and open person – I remember that she would come here, occasionally buy something and leave for her shop on her bicycle. We had a new postcard printed from a photo I took of three frames on the wall here and, looking at it, I realised that all three were bought in Paris. The outer frame is from the Louis XIII period and is a slightly unusual section and pattern. I bought this frame from Virginie Fouquin at Cadres Lebrun – a family firm that has passed down, as far as I recall, from grandmother to mother to Virginie, the third generation. It is a wonderful large shop or corridors and small rooms full to the brim with gold and velvet and carved objects. The middle frame is a fairly standard Louis XIII ‘laurel and berry’ frame, with nice dry gilding – this one came from an auction. 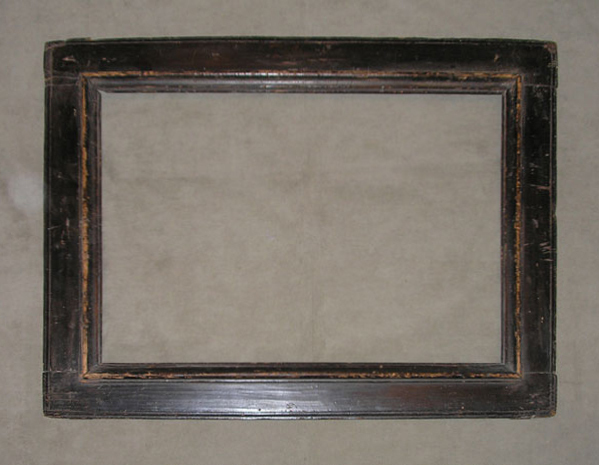 It is a type of frame is very useful – it could suit anything from a van Dyck portrait to a Picasso drawing. The inner frame I bought from Jean Tournadre at Maison Grosvallet who were at 126 boulevard Haussman in Paris – and had been since 1927 until they closed a couple of years ago. 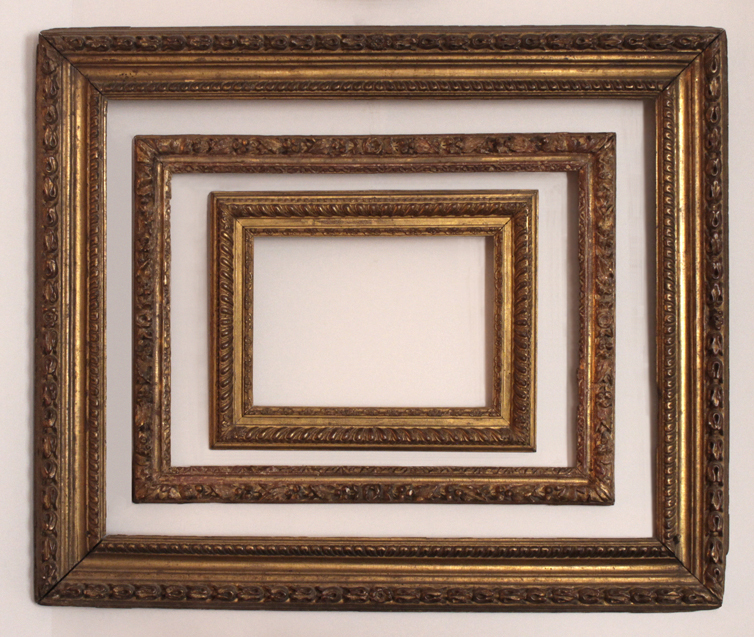 The frame is typical of Grosvallet in being in perfect condition and a very beautiful example – I think it is Venetian. I remember their shop as being full of quite amazing frames, though not that many compared to the other well-known shops in Paris, just very nice. 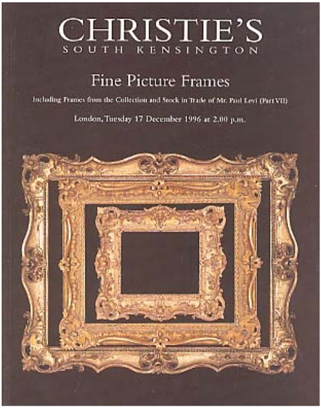 The thing about their frames was the extraordinary condition many were in with a particular finish that is hard to describe – ‘dry’ is not quite right, because also there is both a richness to the surface and a yellowness – very particularly French and fairly unusual to see – they might have liked the lovely Régence frame elsewhere in these pages, itself bought in Paris at auction. Paris, especially the auctions at Eve, Lasseron, Artcurial and Binoche and Giquello is an important place for antique frames, especially since, in London, Bonhams and Christies have long turned their backs on selling such low-value items. But Paris, too has seen other established dealers close and disperse their collections. One of the losses was another three generation family firm, the Galerie Georges Bac who had a stock of many elaborate and fine French 17th and 18th Century frames as well as mirrors and some gilded furniture. They generously held an exhibition in 1991 at the Chateau de Bagatelle with a couple of essays and good photographs of some rather fancy frames. 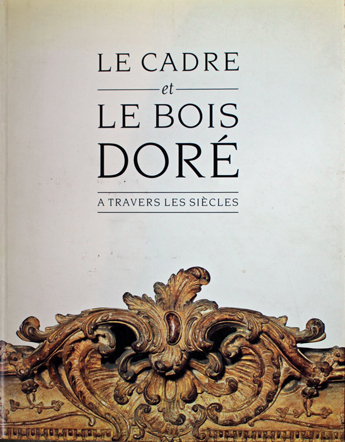 Le Cadre et le Bois Doré (Exhibition catalogue), Paris, 1991. Another, rather different, dealer in Paris was Olivier Franck, who was about my age and had a small shop near the Drouot. When I first started in frames I would go over to Paris on a Saturday morning, go to the Puces at Clignancourt and often visited him afterwards. He was another person with very good taste – I think he would trawl the markets, especially in the South of France and bring back the nicest frames. 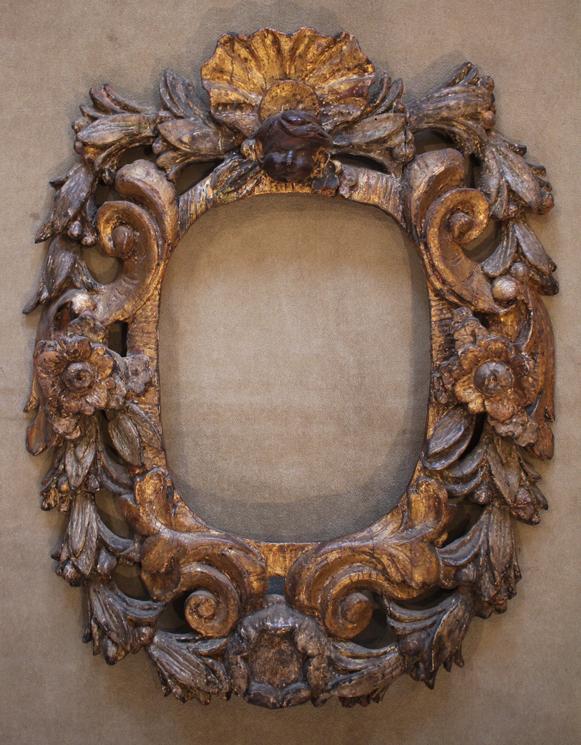 He had a good selection of simple Louis XVI frames, often with prints in them, Empire frames, some earlier ones. It was a time when I could go to Paris for the day (and I wasn’t the only one!) and buy half a dozen things, wrap them up and bring them back to London on the train. One of the things he knew I’d buy was this print after Poussin in a provincial Louis XVI baguette frame. We became good acquaintances, if not friends, until a rather unfortunate event one evening. I was staying the night in Paris and Olivier suggested we had dinner – Virginia was there too, I am not sure why, perhaps there was a big auction. I was not feeling at all well (I suffered at that time from deep troughs of depression) and said no to going out that evening. Later that day another client/friend, older than me, possibly a bit of a father figure and who, with his wife had always been an important supporter of mine telephoned later on and insisted that we went out to dinner with them so we agreed… Of course, who should walk into the restaurant but poor Olivier! I did try to explain but after that he never spoke to me again, which was a great pity.A brief internet search shows that he has given up buying and selling frames and returned to making intense, sometimes large, ink drawings, which are rather beautiful and can be seen on his website. I went recently to the exhibition Drawn in Colour: Degas from the Burrell at the National Gallery. We were involved in framing one of the pastels prior to the show and I wanted to see how it looked. It is a beautiful group of paintings and it is wonderful to see them together with some pastels from the National Gallery’s own collection. Well, I say ‘see them’ but the problem is that you can’t really see them because of the terrible lighting! The room is dark but, just as your eyes are acclimatising to this, you go forward to these comparatively bright spots of murky light. As an explanation there is a sign at the start of the exhibition saying that, for conservation purposes, the lighting has to be kept very low. That is perfectly understandable – but keeping the lighting low surely does not mean it has to be as bad as it is. First it is LED lighting which, even when fully illuminated, is a truly awful light to show paintings in. Paintings, old paintings, were made in natural light or candlelight – (possibly for these Degas paintings the greenish glow of gaslight). LED bulbs mimic none of these. It has a pinkish/greyish colour that seems to devour the vibrancy of pigment, flattens surfaces and covers paintings with a gauzy veil that is at once bright and opaque. Everything looks like it is underwater. 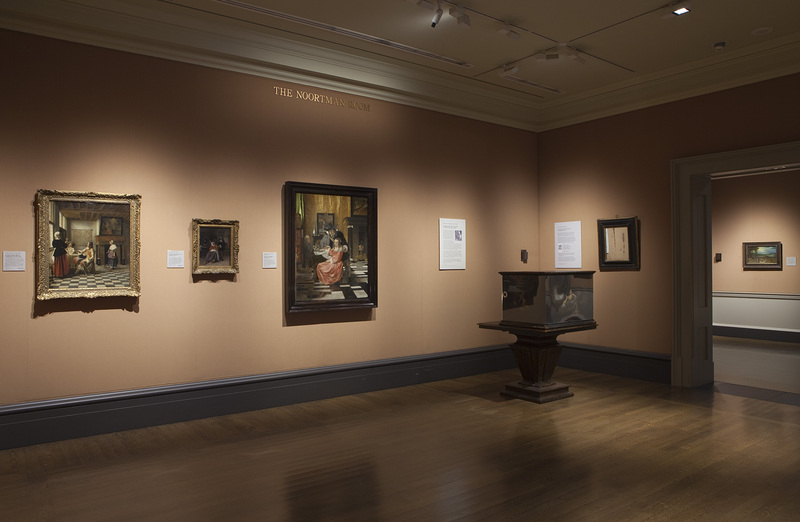 This effect can be seen clearly in the gallery preceeding the Degas exhibition – of plein air oil sketches – the LED lighting makes the green of grass and trees somehow nauseating. But that is nothing to the Degas rooms where we have not just LED’s to contend with but LED spotlights. 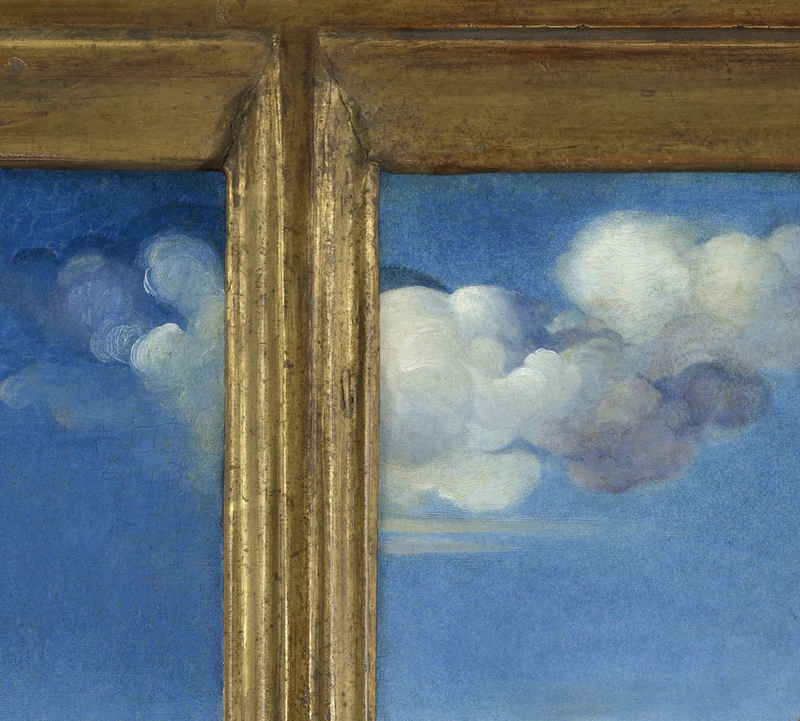 In the photo above – see how the painting on the left is brighter than the other two but also see the darkness of the shadows cast by the frames, both the lower side (against the wall) and the upper side (casting a shadow line on the pastel). Degas’ pastels are partly about light, the effect of light on materials, of backlighting, of light travelling through a space and the work is done by tone. But here they are displayed in a way where by far the darkest tones are those cast by the shadows of the frames — look at the black coat of the figure in the central painting compared to the shadow beneath the frame. Degas’ light tones are also compromised by the lighting – in the painting on the left the glare off the slip of the frame makes a nonsense of the light in the painting itself. The glare off the central frame also diminishes the wonderful effect of light on the fabric of the ballerinas’ dresses. None of this is necessary. Low level dispersed lighting could easily have been used. The attempt to valorise these paintings by displaying them like diamond bling in a Bond Street boutique is misinformed and does a great disservice to the pictures. Instead of being able to concentrate on the works themselves, the eye is constantly coping with, and adjusting to, the dark shadows and glaring highlights all around the work. The result is a wholly unsatisfying experience and, for me, rather a disappointing one. There was a time when I regularly visited Paul Levi who had one of the most impressive collections of antique picture frames ever assembled. I guess the year was about 1993. Other people knew Paul much better than I did, and for much longer, but I still have a strong recollection of what seems now like a different time altogether and somehow, like memories of childhood, always Summer. Each Saturday morning I would take the tube to Turnham Green, walk along Chiswick High Road to Power Road, a looping industrial estate, just before the roundabout for the South Circular and the M4. Paul Levi had two units on the estate, one smaller, a 50’s brick office building typical of thousands similar, down the end of a dead end road. There was a small room here, probably once an office at the back of the building, now just a narrow corridor between two racks of mainly smaller picture frames, floor to ceiling. I remember the atmosphere, dry and slightly fragrant, remarkably quiet, like a lost place, racks of closely packed antique frames and silence. I had first met Paul when I worked at Wiggins, who were buying a group of frames from him. That first time I met him he did what he would later do often, test me on what a frame was: I remember it was a large Spanish centre and corner frame. I passed. 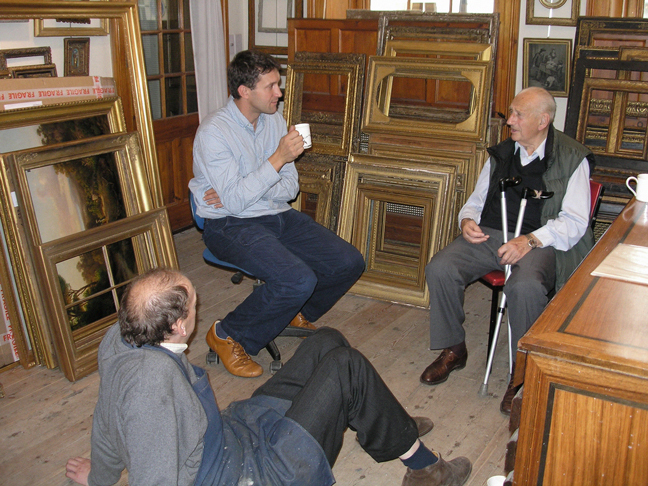 My thought is that he, who was very proud of his collection of old frames, was happy for anyone enthusiastic enough to spend their own time looking through them. I know that I was not the only person doing something like this and there were also others who were in the process of buying groups of frames from Paul, notably Wiggins who did, as far as I remember, some kind of extraordinarily complicated deal with him involving several groups of frames and complex payment terms. 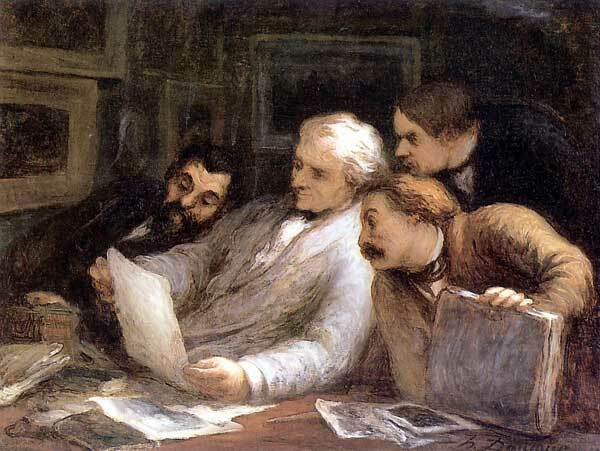 There was also one or more dealers in old Master drawings who were trying to buy frames from Paul. My understanding of Paul Levi is that he began in frames at Polak in Blue Ball Yard, round the corner from where we are now, I guess this was just after the end of the war. He then he started on his own, from about the late 1950’s onwards, first in Paddington then at Chiswick long before there was really a market in old frames. Arnold Wiggins existed then but I think mainly dealt in English frames (there was a famous rumour that old Mr Wiggins had a stack of English paintings, among them valuable Gainsborough, Reynolds and Romney portraits, from which he had removed the frames, which was the bit he was interested in). Paul always had a more continental taste – he understood the extraordinary quality of early Italian frames, 18C French frames. He bought consistently and he bought very good things as they became available from antique dealers, picture dealers, auction houses and his contacts. Since so few others knew (or cared, possibly) about old frames, I don’t doubt that he bought many of them very cheaply. Paul mainly bought frames as ‘models’, that is frames to copy from, not to buy and sell as we do now. The result was that he built up a collection of antique frames, a collection that I do not expect will ever be rivalled in quantity or quality – he must have had in excess of two thousand, many that he had cleaned and repaired. He had something like thirty 15th and 16th Century Italian tabernacle frames, bays full of smaller frames, Dutch, English and French frames from the 17th and 18th centuries. They all had a distinctive label on the back. By the time I got to know Paul he must have been in his early 70’s and was winding down. The workshop was never very busy. Between jobs, after I had left Bonhams, I did a full valuation of the frames with auction estimates which I remember being very difficult to do as how to value so many very good objects all together like this? 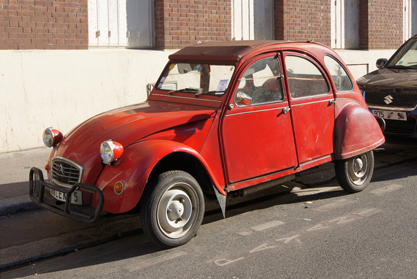 Still, he paid me and I remember I bought a third hand 2CV Citroen with the money. 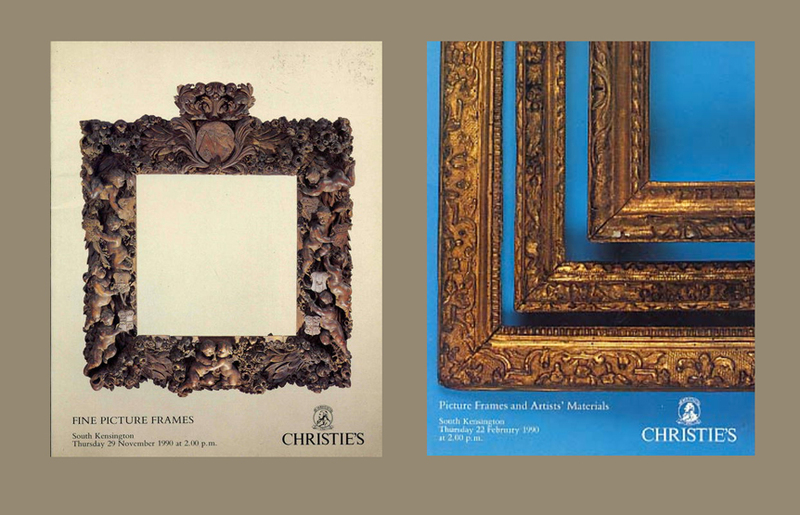 In the end, once the frames had been picked over by various dealers, the remainder went not to Bonhams but to Christies who had something like 12 sales of frames over a two or three year period. I clearly remember when I had first started out on my own, going through the first of those catalogues with some of the best frames in it, and thinking can I buy any of this? Cash was tight to begin with for me and I am not sure if I did buy any from that sale, though I remember sitting through it. I bought in later sales. In hindsight, of course, I wish I had bought more, from that first sale and the subsequent ones. But back then it seemed that the supply of old frames was never-ending and would never dry up almost completely like it has. I haven’t mentioned Phyllis yet – his assistant who had been with him in the business since anyone could remember and who, I remember, looked after me with cups of tea and making sure that Paul noticed I was there. Phyllis is still alive, living in Nottingham and we have occasional contact. I remember her in Paul’s office, which was messy and had a huge metal german-looking desk in it. I remember Paul had some roughly built cabinets with a small collection of Lucie Rie pottery in them, which made me admire him even more. and the other a strange 17th Century English frame (perhaps a wall sconce?) in silver leaf and gilded. When I was establised on my own, I kept in contact with Paul who would often come to the shop to have coffee and listen for any frame-gossip. He was increasingly disabled by his hips and walked with two sticks, he couldn’t go downstairs here at St James’s Place. I think it is fair to say that without Paul’s influence I, and others, would not be doing what we are today. … and sold the bulk of Paul Levi’s collection of frames, some of which I bought and ended up on good paintings. In fact, I think I bought my first ever frame at South Ken – a Lely panel frame. Walking past the building on the Old Brompton Road I think of all the time I spent there and, of course, of all the people who have lost the jobs they fought hard to get, all the years of expertise, knowledge handed down over generations, that is being made redundant, thrown to the four winds. The worst of it is that with the closure of South Ken old things have one less place to go to be sold and bought, to find new owners and have new life. 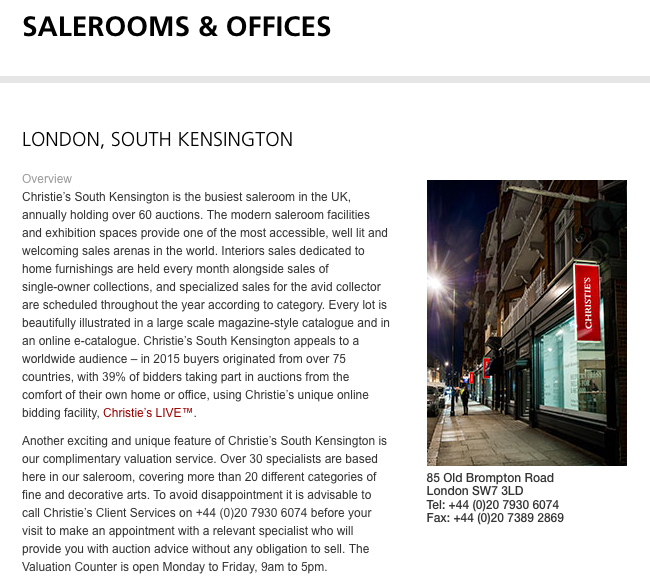 I’ve heard that South Ken has consistently been a profitable business with margins, I guess, that the modern and contemporary departments at the prime auction houses could only dream of. When asked the question – why on earth would they close such a successful operation? 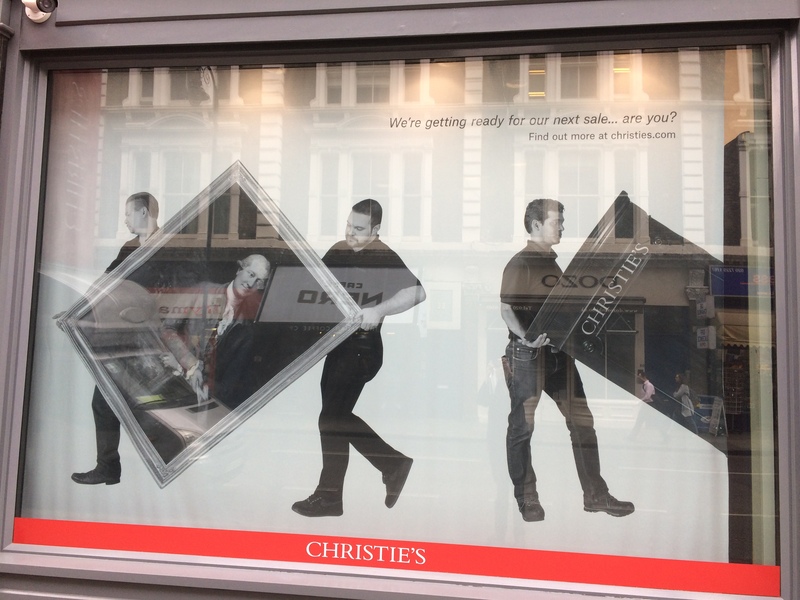 one suggestion is that the owner of Christie’s wants to streamline the business for sale and that selling lower value or decorative, or even old, art was not a valuable part of the brand. The windows have a poster with some porters doing staged porterish things (one with what looks like a wheelie bin but is, I think, a rostrum). The words above them have a certain piquancy now. I see that from 2018 there will it will no longer be possible to take an Art History A level. The Guardian put the blame squarely on the shoulders of the former Education Secretary Michael Gove. I suppose in this country now this should not come as too much of a surprise. In Britain now education is being sold off out to bankers with their creeping tentacles, turning everything into profit. I did A level History of Art. At the time it was just an ‘extra’ to fill time as I had done my other A levels a year too young and I had to re-take one of those anyway. I remember that of all the ‘hard’ subjects I did, ‘soft’ Art History was the one where I had to think most clearly. It was also in that dark room with the slide projector and a truly wonderful teacher (who was possibly the first person I ever fell in love with) that I learnt to look at paintings and buildings and began to learn to use and trust my eyes. I read Gombrich’s The Story of Art. I learnt to ask questions: about paintings, about history, about Europe and Christianity, about connecting things, about influences and development. I learnt about money, luxury, greed and power. I learnt for the first time the sheer excitement of being able to look at Monet’s brushstokes, about the Englishness of English art, the exuberance of the church of the Vierzehnheiligen. It was in that room that I first saw the Isenheim Altarpiece, the East end of the Basilica of St. Denis, the Unité d’habitation. Seeing all of these, for the first time doing an Art History A level, has been profoundly important to me and it is not a great stretch of imagination to say that it has also been very important to my work as a picture framer, work that has over the years given many people their livings, crafters and dealers who have paid their taxes and been functioning parts of the social economy. 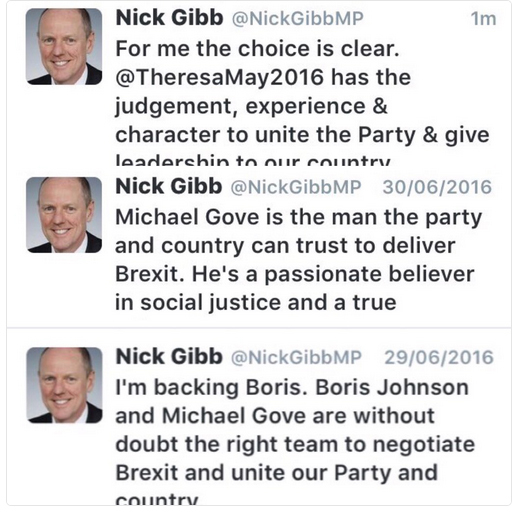 Until he was sacked, we are the ones who paid Gove’s wages. An update – Art History A level might be saved! is what the French call Spot the difference! Both photos show the same frame – or is it? Lot 297 at a sale in Paris. 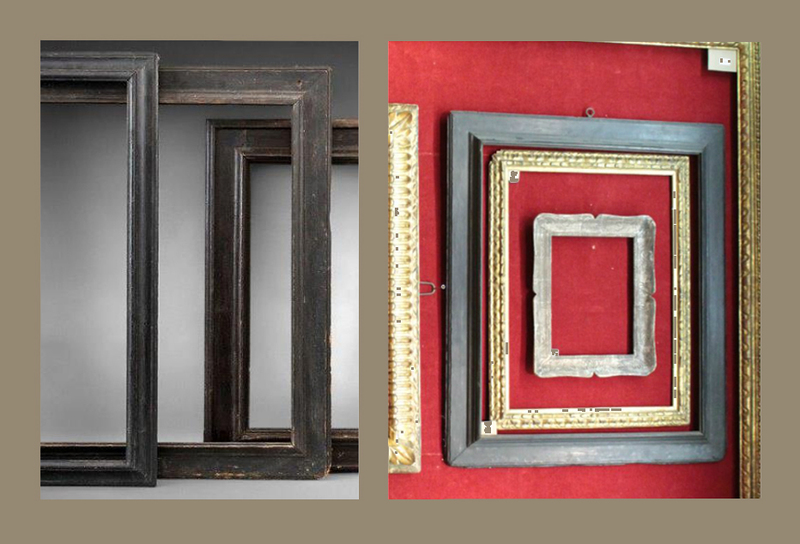 Photo on the left shows the frame in the sale catalogue – as it must have arrived from the consignor – lovely overall patina, knocked, rounded lower corners and a largish hole through the flat, top right. I love frames that look like this. But on the view, in the saleroom – the photo on the right is from our old friend Drouot Live – something has happened to it. In fact, I barely recognised the frame I had marked in the catalogue as one to buy… No hole, no rubbing, no bare wood, no patina at all. The only thing I can think of is that someone has ‘repaired’ it – well, repair is the wrong word for some bright spark with a pot of polyfilla and black paint completely losing all the good things about the patina and finish and just originality of the original. It is not possible to get back what has been lost like this. 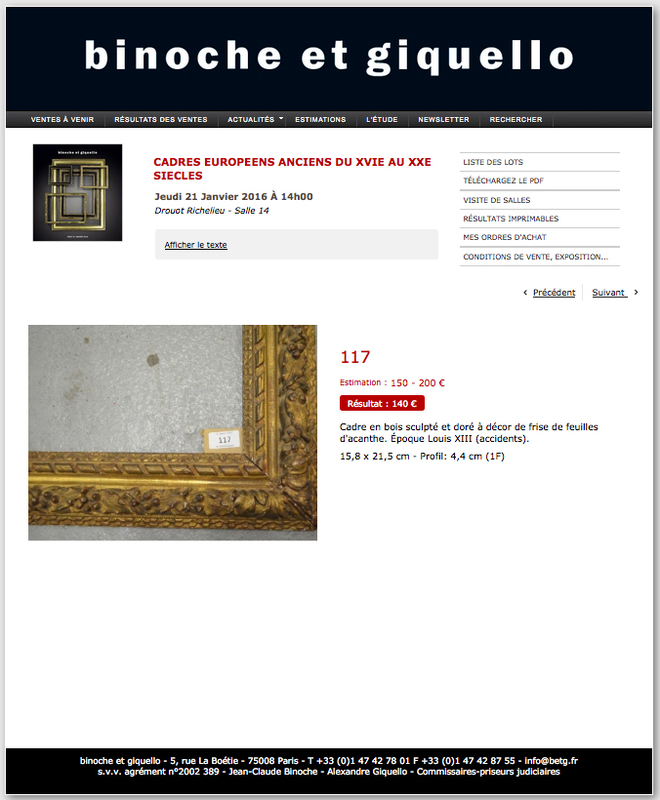 It is wrong to do this for several reasons: First, it is a bit dishonest – what if I had bought the frame on the strength of the catalogue photo? 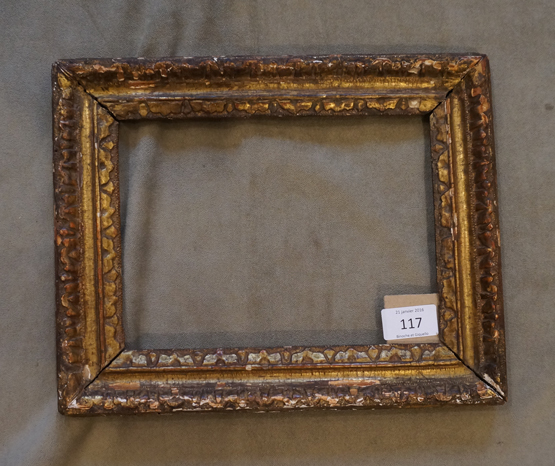 Second, because it is a bit stupid – it meant that in this case the frame did not make as much as it might have had I entered the bidding (it sold on the reserve). Third, because it is just barbaric and a terrible shame. It shows a monumental arrogance and disregard for antiques as they are and adds to the feeling of bad faith (mauvaise foi) that sadly pervades most aspects of dealings with auction houses in Paris. Sebastiano del Piombo (1485-1527) Adoration of the Shepherds at Fitzwilliam Museum, Cambridge in French Régence carved frame (conservation still in progress). The Fitzwilliam Museum have recently re-installed this wonderful painting after years of careful restoration at the Hamilton Kerr Institute just outside Cambridge. A good short film can be found here which explains a little about the painting and conservation, but doesn’t mention this rather splendid frame that we were lucky enough to find for the painting. 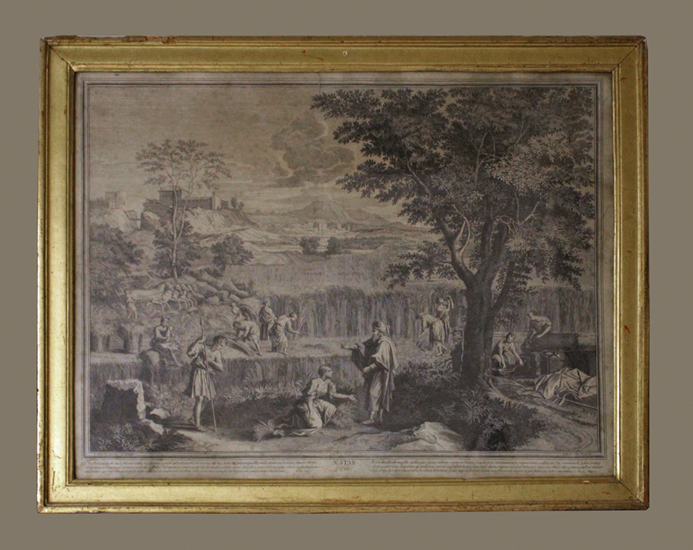 The painting is first recorded in a French collection in the 18th Century and given this provenance it was thought that a French 18C frame might be suitable . There was also a need to cover about 4″ of unpainted canvas at the lower edge of the painting meaning that an Italian frame of the period would not work since it would not be possible to enlarge the rebate of a cassetta or reverse section frame to that extent. 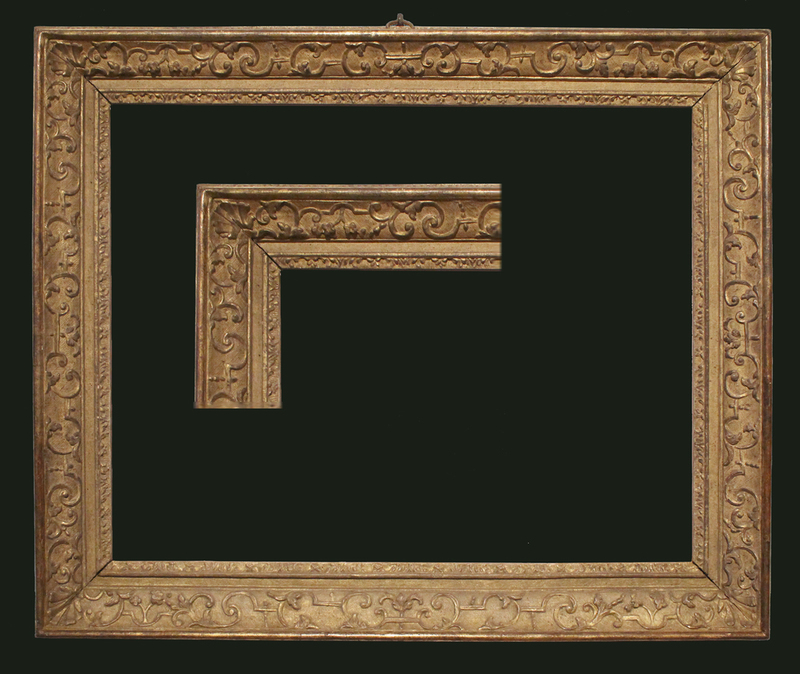 The French frame, of a hollow section and more than substantial enough for the larger rebate also fitted the painting in the height and needed only 3″ adjustment in the width. I had bought the frame some time ago in London and, like so many French frames brought here, in the 19th Century particularly, it had been overgilded. The colour is good, but not original. The painting also made its way to England and the collection of Lord Fitzwilliam in the early 19C. There has been lots of excitement at the Paris auction house of Drouot recently http://www.theguardian.com/world/2016/mar/14/drouot-auction-house-porters-pilfering-theft-trial-france. Anyone buying regularly, as we have over the years, at Drouot will be familiar with the various tricks they get up to there. I heard of one person who wanted to buy something but whose hand-in-the-air was conspicuously overlooked, only, he said later, ‘because I was English and there was a French chap who wanted to buy it’. Recently we have had our own run-ins – we bought a ‘Cadre a Tabernacle en bois sculpté et doré. XVI sieclè (petits accidents)’ from a sale of frames with Binoche and Giquello. All I can say about that one is Caveat emptor! When it arrived we got this frame instead – which, as you can see, is not the same frame at all. Guess they must have swapped the lot number over. Crafty. We got in touch with the auction house and they said there had been a ‘mistake’. That’s one way of putting it. Then they said it was our mistake! 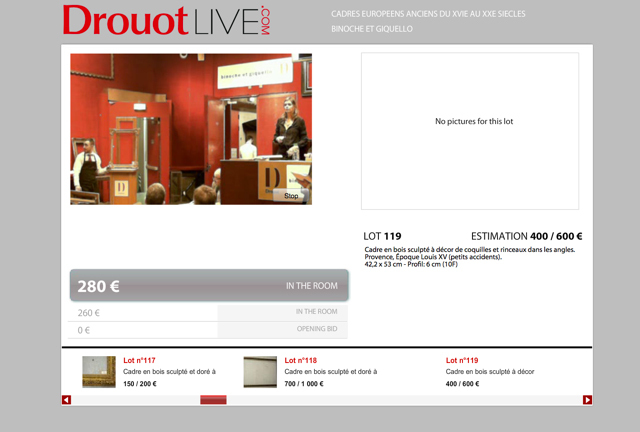 We should have been at the auction in person … (so what’s the point of ‘Drout Live’?) They said the wrong frame was put in the catalogue and that was our fault too! They said that if we wanted our money back we should ship the frame back to Paris. Only thing is, we had just paid to have it, with some others, brought to London. Their view was that we were a ‘grand galerie à Londres’ and that it would be no trouble to pop it back to them. What I really wanted to know is what happened to the frame with the 117 number on the concrete floor? I asked in an email but the question was ignored. Where are you, real lot 117? 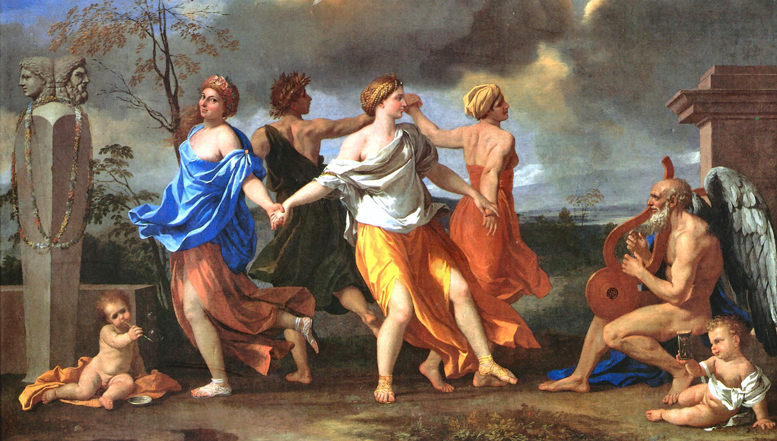 Detail from A Dance to the Music of TIme by Poussin. At first I liked pictures and was at art college for a period. I started working for a picture framer by chance, because I needed a job, and soon discovered that I was drawn to these strange things that few others noticed. I worked for Arnold Wiggins where I probably learnt a certain kind of taste for frames. I then worked for Bonhams auctioneers who, then, had something like twelve sales of second-hand and ‘fine’ frames a year – probably about three thousand frames a year! After that I worked for John Davies who was, and is, well known for his reproductions of Dutch 17C ebony and pearwood frames. It was during this time that I started collecting old frames for myself and in 1996 I started dealing in them. Now, almost twenty years later I am sometimes not so sure I enjoy the business of being a picture framer, but I still like old picture frames. One of the reasons for this is that they are neglected. They are often quite solid things and some survive the depredations of art-dealers who chop them around and private individuals who leave them (often with paintings inside them) in damp cellars, dusty lofts, dark corridors. I rather like their orphan status – orphans that are also survivors. I try to remind myself that all the old frames in our stock were once made with care and attention for other paintings from which they since been removed and replaced. 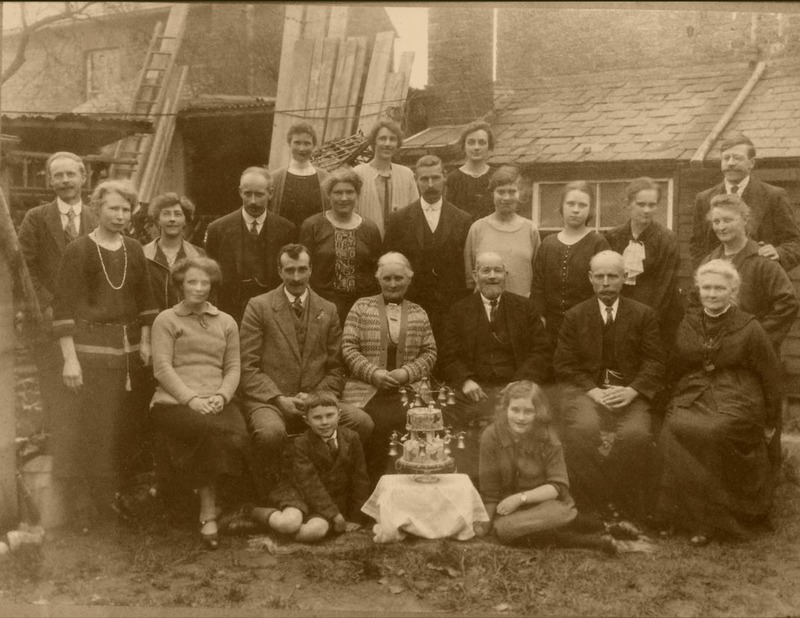 This story illustrates the history that we can guess at looking at an old picture frame. I once had a slightly tatty, overgilded, French Louis XV frame which I knew (from a label on its reverse) had recently been removed from a Dutch painting by Frans van Mieris. I made up a plausible history of the painting – painted in Holland in about 1650, and possibly framed in an ebony frame, the small painting (Frans van Mieris only did small paintings) found itself moved to France by 1750 – the waning of the Dutch Golden Age was matched by increase in power of France – and the money moved there. In time the French golden age was also to come to an end with the Revolution. In the 19th Century the money moved North – to Great Britain and with it this little painting in its French carved frame. 19C England had its own taste – and many French frames were re-gilded with oil-gilding. And so it stayed from the mid 19th Century to the late 20th when it finally came up in an auction. It was bought by an art dealer, a specialist in Dutch paintings, who frames all his pictures in Dutch style reproduction black frames. So the French carved frame with its English over-gilding was taken off the painting and ended up with me. I removed the later flat and dirty oil gilding and revealed the French gilding beneath. I sold the frame to an American frame specialist. I rather regret it now. 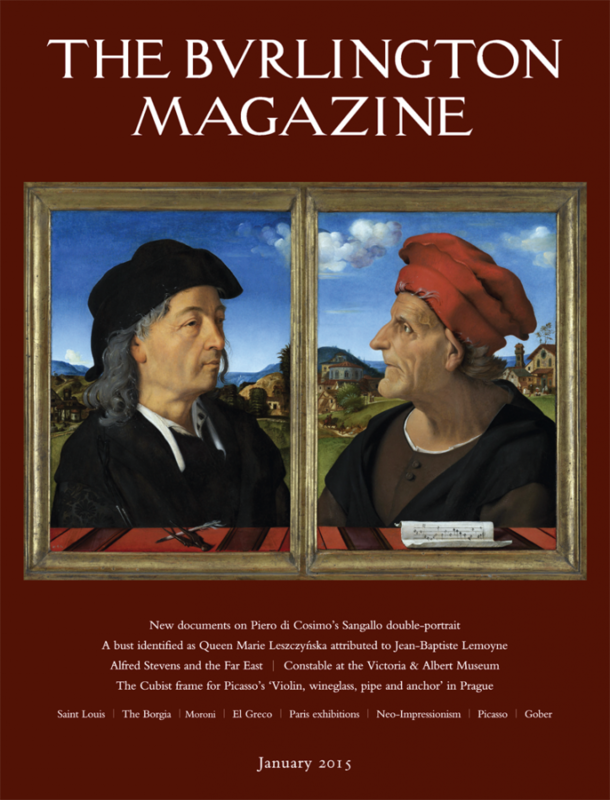 A frame that we made is shown here on the cover of The Burlington Magazine for January 2015. The painting is in the Rijksmuseum in Amsterdam but currently on loan to Washington for an exhibition and then on to the Uffizi later in the year. The frame needed to be substantial enough to provide protection to the painting but we narrowed the moulding on either side of the central bar to preserve the visual continuity of the beautiful landscape background. 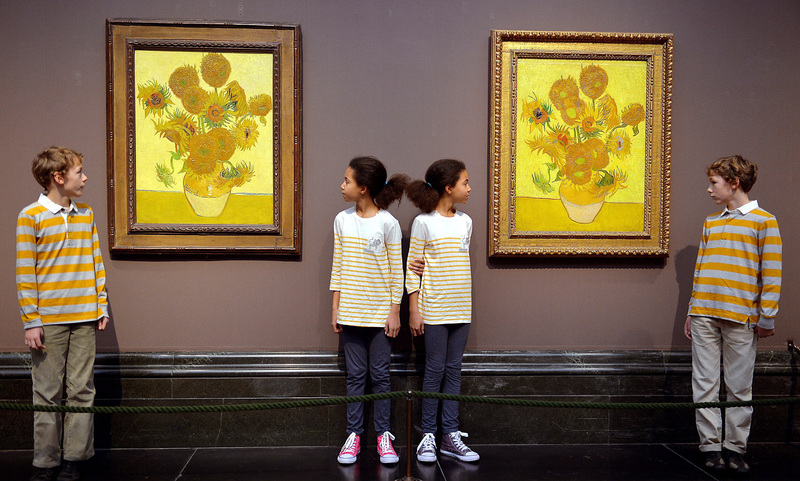 Photo taken from Financial Times, January 2014 of the two Sunflower paintings brought together at The National Gallery. I bought the frame on the left from one of the Paul Levi sales at Christies in South Kensington – it was the former head of framing at the National Gallery, John England, on a visit to our studio then in Bond Street, who realised what a match it was for the Gallery’s Sunflowers. Of course it is tempting to try argue that one presentation of this subject is ‘better’ than the other – I’d prefer just to accept that they are different and enjoy the difference. While we are in the National Gallery … We lent a framed mirror last year for a rearrangement of Dutch 17C paintings organised by Albert Godycki which gathered together depictions of the interiors of Dutch houses, an important genre of painting in this period – and fascinating to think about. I wish there were more mirrors in the National Gallery. Mirrors are about looking, of course – though, as I think Lacan said, they show us precisely what is not there – that is, all is reversed. Looking at things backwards (or back to front) is a very good way of looking. In the 17th and 18th Centuries so many paintings were published as prints and many were printed back to front (left transposed to right). People interested in paintings often saw them first this way. Mirrors are about looking – galleries should be about looking too but we look at a picture very differently to the way we look in the mirror. We don’t, that is, look in a painting but at it – one reason that the Hoogstraten Box (just below the mirror in the photo above) is also interesting, because you do have to look into it. Mirrors can also help us see obliquely. Too often we plonk ourselves in front of a painting, and expect something to happen, which it often doesn’t – and so we go and read the label – and move onto the next painting feeling possibly just a little disappointed. You only have to stand in a room in the National Gallery for a moment to see this happening, over and over. We all do it and I think that one of the reasons is that we are expecting, looking for something. Instead of ‘looking’ we should try instead seeing obliquely, letting our eye be caught, glancing – finding the way into a painting rather than just the perpendicular, standing-in-front-of, look – like diving obliquely into water. Mirrors can help us, they give us oblique views, show us what we might have missed. If mirrors are about looking then in a gallery they can also show us what we often just don’t see – other people looking at pictures. We don’t need to stare at other people: we can spy on them instead, just as we can spy on the paintings they are looking at. Eugene Isabey (1803-86) The Shipwreck. Carnegie Museum of Art, Pittsburgh. I bought heavy French fluted hollow – the one in the picture above – in an auction at the Drouot in Paris. It was covered in bronze paint but was not expensive. 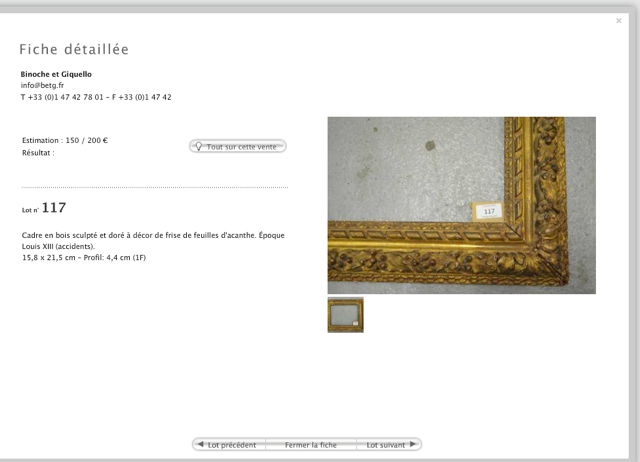 Six months or so later a dealer came to me looking for a French Salon frame for a painting by Isabey. He needed the frame in a hurry and insisted on going with me to our store, which was then located in an arch under the railway at Kings Cross where we kept larger frames and things awaiting attention to make them presentable. Once there he spotted a heavy fluted hollow: ‘What do you think this would look like on the painting?’ he asked. I think I replied that it would be rather too heavy on it but we pulled it out and realised that it was, in any case, a good fit for size. 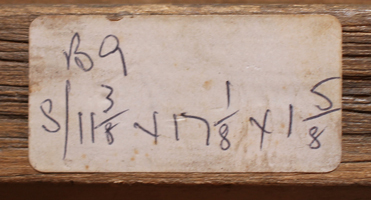 When we looked at the back we saw, in a painted brush script, the word ‘Isabey’. 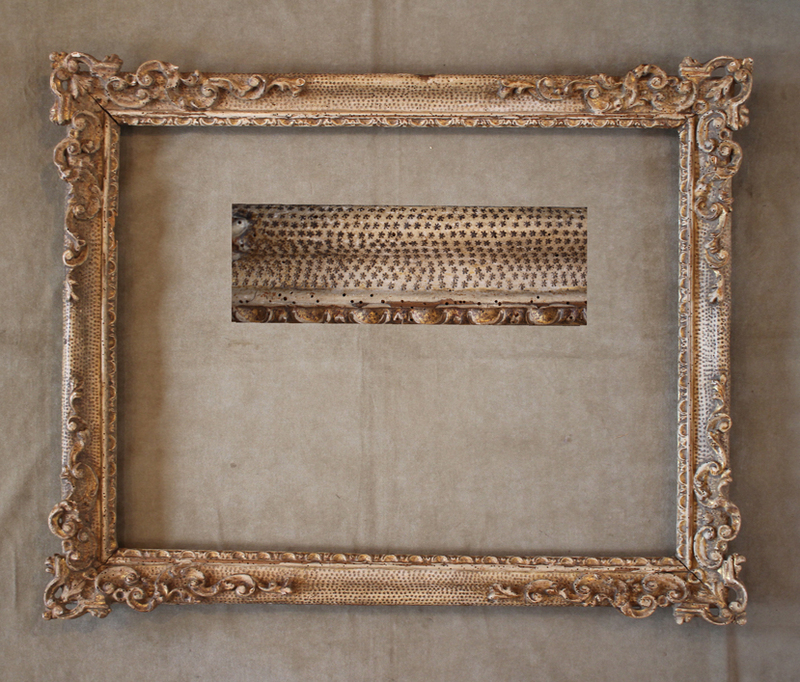 When we tried the painting with the frame we realised that it was the original frame – the nails that had been originally used to fit the painting had left marks on the stretcher and holes in exactly same places in the frame. The painting had also been bought in Paris and the two must have been separated. We removed the bronze paint, cleaned the gilding, did some minor repairs and fitted the painting into its original frame. It ended up in Pittsburgh. What is interesting is that the frame does, to today’s taste, look too heavy for the painting. We must try to remember to try to put ourselves in the minds of our forebears if we want to make a frame look authentic. Our first studio was on the first floor of No.9 Old Bond Street, now an upmarket knicker shop. Then, the building had three picture restorers in it – Wendy de Beer on the top floor, an Italian called Tomasso Schneider on the second and on the first floor Hamish Dewar. Hamish wanted to move to larger premises in Mason’s Yard (where he still works) and asked if I would like to take over his studio, which I did. We stayed for six years. I remember sitting in the window (on the right in this photo), looking out over Bond Street across at Agnews and Noortman, now, respectively, a clothes shop and a jeweller). When the building was sold to a shoe shop in 2003, Wendy moved to Paris; Tomasso moved back to Italy where sadly he died about five years ago and we moved the other side of Picadilly, to 41 St James’s Place, where we have been ever since. It is not quite true to say that No 9 was our first studio – for under a year we were over the road in a tiny attic that had previously been a wig-maker’s workshop (there was hair still in the corners). The stairs were very steep and the ceiling was so low I could only stand up in the middle, but it was very cheap and ideal as a place to start from. It was a distant cousin, John Whately, who worked for the Dutch dealer Rob Nortman who said we could use the empty attic rooms. 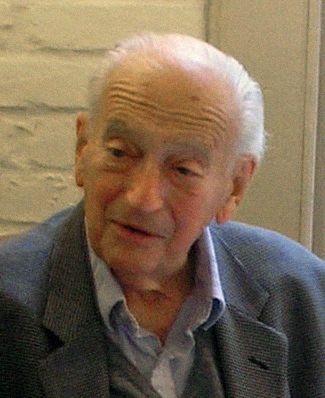 John was a lovely man with a remarkable eye for Dutch paintings who died in the late ’90’s. I owe him a great deal for that first leg-up. Unknown Photographer ca. 1900, formerly Uwe Scheid Collection, Munich. Of course there is much to be said about the frame as container for paintings. One day I bought an old picture frame – Spanish 18C, what is called a ‘plate frame’ – I had no idea when I bought it what a useful frame sample it would become. Over the next few years we found ourselves copying it, often for modern drawings of a particular type – it got to be known as the Schiele frame – and we have copied it over and over again – we make very good copies of it – all the woodwork run by hand with moulding planes and we take great care to find good old floorboard pine. 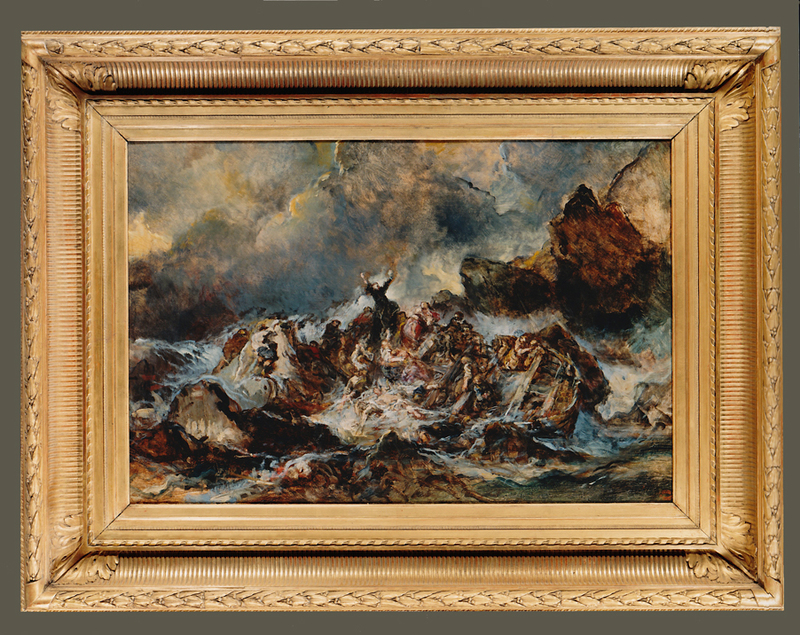 The frame works very well with modern paintings and drawings and is not too expensive to reproduce. As the years have gone on we have started to see copies of our copies – not as good as ours but clearly modelled on this same frame. Imitators say that copying you is the sincerest form of flattery but they might just be covering for not having any of ideas of their own. For us it is rather irritating – all the more so since the person thought to be doing it is someone we used to work with. Of course I don’t have an intellectual copyright on the idea of using this frame – it is an old thing and was not my invention in the first place. On the other hand I did spot it and get hold of it, keep it, develop it and make an investment in getting the copies right. It doesn’t seem right that someone can take all that and turn it to their own advantage. In my years working in picture framing I have made many friends with colleagues who are in the business – I have worked as an employee for other framers who I still work with from time to time – and I have met some wonderful craftsmen and women for whom I have great respect. There are others, unfortunately, who do things differently and in, in my view, a much less constructive way. * TWOC (present participle in slang, twoccing or twocking) is a police accronym for Taking (a vehicle) Without the Owner’s Consent and derives, according to Wikipedia, from the wording of section 12 of the Theft Act 1968. We used to see people in our shop who collected paintings or drawings but those people are much scarcer now -so are the paintings and drawings. Which makes me wonder about collecting – and who collects things and also about connoisseurship – those people who don’t just collect things but are also very alive to the quality of objects. They often seemed to be educated amateurs for whom collecting, say English watercolours or French 18C drawings, was a quiet passion and they often really knew their chosen field very well. I read somewhere, I cannot remember where now, that collectors are often men – it is a male thing to do to collect, get the full set, have the best marble/conker/first day cover or drawing by Fragonard/print by Warhol. Perhaps it is just a daft generalisation but it might be worth considering whether the change in the position of women in society has contributed to the decline in collecting. The other thing that has dramatically changed collecting is the internet. No fun anymore: no hunting in second-hand bookshops anymore for that missing Volume VII of your Nonsuch set of Dickens – just look it up on Abe (owned by Amazon). You can find anything you want at a click. Because it is so easy to get things much of the fun of collecting, hunting things out, finding that Volume VII in perfect nick at the back of a bookshop in a small town, is gone.